Out of Time's Abyss is the third book in the Edgar Rice Burroughs Caspak trilogy the first two being The Land That Time Forgot and The People That Time Forgot and continues the lost world saga. 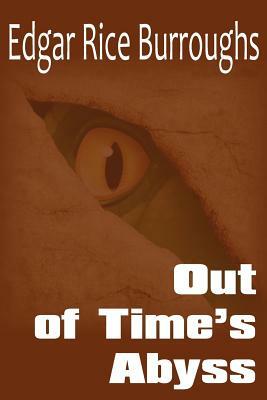 Out of Time's Abyss begins with Bradley, who had left Fort Dinosaur on an expedition in the first novel and never returned. Bradley and his party are attempting to return to Fort Dinosaur when they encounter a creature which appears to be a flying dead man. Bradley disappears during the night, and the remaining members of the party make it safely to Fort Dinosaur. "This is the tale of Bradley after he left Fort Dinosaur upon the west coast of the great lake that is in the center of the island. "Upon the fourth day of September, 1916, he set out with four companions, Sinclair, Brady, James, and Tippet, to search along the base of the barrier cliffs for a point at which they might be scaled. "Edgar Rice Burroughs was an American author, best known for his creation of the jungle hero Tarzan, "Lost worlds" and the heroic Mars adventurer John Carter.